You'll laugh. You'll cry. You'll be amazed. 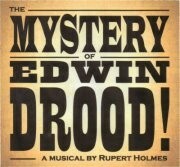 But can you solve the Mystery of Edwin Drood? The very energetic company of 'The Music Hall Royale' presents the Premiere of the stage version of Charles Dickens' book in a gloriously traditional music hall style, together with visible backstage shenanigans and tantalisingly catchy songs that are hard to resist. The audience is given the task of voting on the identity of the murderer (if indeed, Edwin was murdered at all!) thus determining the ending of each performance from a variety of possibilities ... So join in the fun at the Music Hall Royale as a troupe of players takes you on a musical romp through Dickens' last, unfinished, novel and asks - whodunnit? This show needs YOU!